Chevel Shepherd relaxes with members of Wild Country during a break Wednesday in rehearsals in Bayfield for her homecoming concert on Jan. 26 at the Farmington Civic Center. 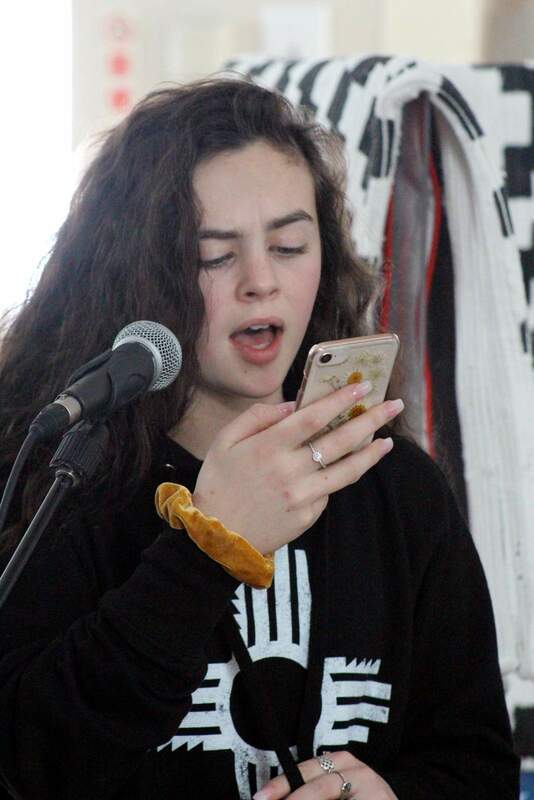 Chevel Shepherd reads lyrics from her cellphone during rehearsals on Wednesday. The 16-year-old singer practiced “House of the Rising Sun” and “If I Die Young” in Bayfield. Band members from Wild Country pose with 16-year-old new country star Chevel Shepherd. Behind her are Tim Craig, left, Garrett Young, Shawn Hendricks, Ted Hockenbury and Ben Simpson. 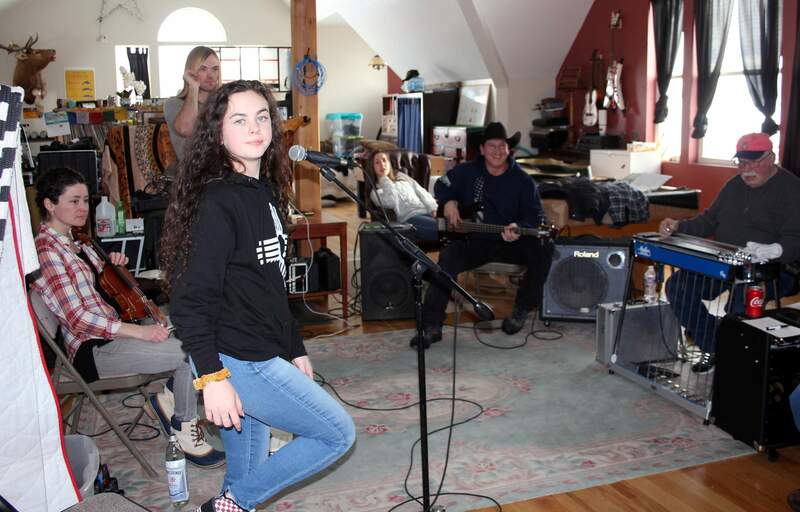 Chevel Shepherd, center, prepares to rehearse her lyrics on Wednesday in Bayfield. 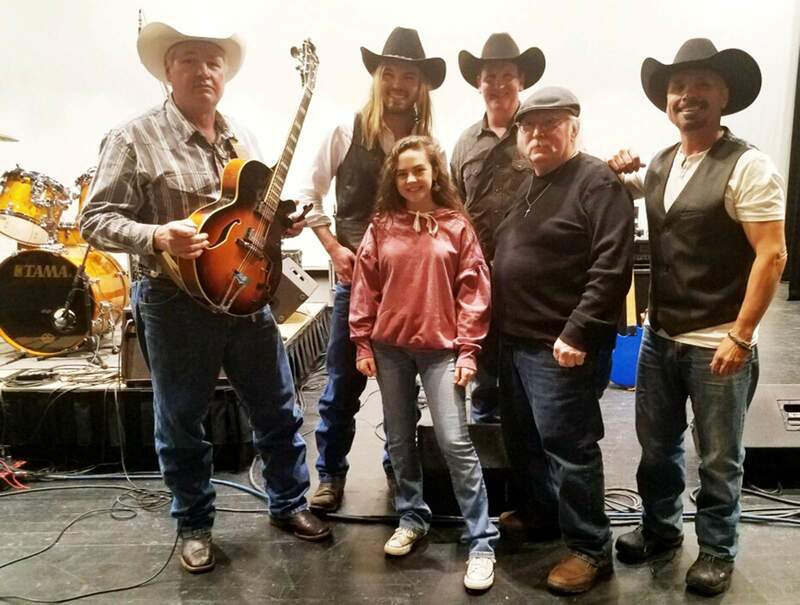 Bayfield’s favorite country band has scored a big gig – performing with new star Chevel Shepherd when she plays her free homecoming concert on Jan. 26 at the Farmington Civic Center. Last month, the 16-year-old country singer won the grand prize on The Voice. She’s starting work on a new album with her coach from the show, Kelly Clarkson, and planning how to spend the $100,000 grand prize money. But first, there’s the welcome home concert. “I’m doing this concert to give back to everyone who supported me and voted me through to the end,” Shepherd stated in a press release. Chevel and her family hosted auditions for about 10 local bands to play with her, and Ted Hockenbury, the founder of Wild Country, got the call a few days later asking if they would like to play. In addition to Hockenbury, Wild Country’s current lineup includes guitarists Garett Young, Tim Craig and Shawn Hendricks, as well as drummer Ben Simpson. For the Farmington show, they’ll be joined by Ryan McCurry on keyboards and Alissa Wolf on fiddle. On Wednesday, Shepherd and her parents came to Bayfield to rehearse with the band. “I love to play with her,” Hockenbury said. She leaves for New York soon to work on business and music deals, but the band told her if she returns and needs backup for regional concerts, they would be happy to join her. At 16, the petite singer has a massive voice, which many have compared to country legends Dolly Parton and Loretta Lynn. She said she would like to create a classic country album first to play homage to her favorite genre. At Wednesday’s practice, she looked like a regular teen, wearing jeans, sneakers and a sweatshirt with a Zia symbol emblazoned on the front. Her voice is hoarse, so she sang softly during practice. She was raised on country music and the outdoors – often doing crafts, feeding the animals and fixing up cars with her dad. Since Chevel was 8, she has been singing in Farmington wherever she could, but now she’s excited about bigger musical opportunities. After Wednesday’s practice, Wild Country and her dad jammed on the guitar. Those who want to see her concert will have to beg, borrow or steal tickets, which were distributed in a matter of minutes on Tuesday. VIP seats to benefit the Childhaven Foundation also sold out quickly, as well. People who acquired the free tickets are asked to bring dry or canned cat or dog food that will be donated to local animal shelters in the Farmington area, or non-perishable food items to be donated to the Echo Food Bank. The Jan. 26 concert is at the Farmington Civic Center. After Midnight, a Farmington band, will open the show at 6:30 p.m.